Preliminary – Battle Damage Assessment (P-BDA) – On April 29, 2018, 2230 local time, a round of unclaimed military strikes pounded locations jointly operated by the Bashar al-Assad regime and Iran in Syria. The targeted sites are: the 47th Brigade Military Base in Hama province (Objective-Alpha/ O-A) and the Zeido Auto Test Center near Aleppo Airport (Objective-Bravo/ O-B). The Syrian government and its allies are accusing the United States and Israel for being behind the strike. The following P-BDA assessed by T-intelligence (Ti) outlines the nature of the targets acquired for striking, and determines why the Israeli Air Force (IAF) was most likely behind the attack – with limited U.S. support or knowledge. (1) The first target (Objective Alpha/ O-A) is located near the village of al-Safira (10 km south of Hama city) and is a key military barracks and logistics hub for operations ongoing in the Hama war room. The facility hosts a personnel housing center, various command & control compounds and many weapons storage bunkers. It also sits next to a major (officially) porcelain factory, rumored to be used for weapons manufacturing. The base is jointly operated by the Syrians and Iranian elements: both Revolutionary Guards Corps (IRGC) and affiliated indigenous paramilitary units. (2) The second target (Objective Bravo/ O-B) is a warehouse in the Malikiyah industrial area next to the Aleppo Airport (Aleppo province). There is little information available about this location, except that it was not a military facility, but civilian. Given its proximity to the Aleppo International Airport, Ti assesses that the buildings might have been used as a clandestine weapons storage center for fresh deliveries landing in Aleppo from Iran, before being distributed to other regional war-room hubs. This is would be a rational increase in tradecraft and counter-surveillance methods to avoid Israeli Intelligence efforts of monitoring hangars and warehouses in the Airport itself for target-acquisition – since the IAF managed to succefully identify and strike all of Iran’s favorite hangars in the Al-Assad International Airport in Damascus (for example). 3) O-A saw a round of successive explosions that amplified under a chain of secondaries (detonation of weapons, ammunition and ordinance deposited there). The European-Mediterranean Seismological Center recorded a disturbance registering 2.6 Richter magnitude scale caused by the blast in the area. The British-based Syrian Observatory for Human Rights (SOHR) notes that at least 26 people have been killed, and around 60 have been injured – most of them Iranian, and a few (confirmed) Syrian soldiers. 4) O-B was hit around the same time but the target and ordinance employed was far limited and reduced. No casualties reported from this site. Reports indicate that it was emptied. Since the Syrian Civil War boosted Iranian activity inside Syria, Lebanon and around Israel’s borders, Jerusalem sought to balance its security needs and military interventions. Besides clandestine and limited supported for a few selected Opposition groups operating near the Golan Heights, Israeli opted for intelligence-based targeted air strikes on key Iranian facilities that proliferate advanced weapons transfers to Hezbollah – most concerning, long-range missiles. The Israeli Air Force (IAF) has conducted dozens of clandestine air raids against such objectives throughout Syria – the usual targets being in the wider Damascus area, Hama and Homs. The IAF’s policy is to not comment on external engagements in synchrony with Jerusalem’s policy of deniability. Based on the following findings Ti believes that this was another such shadow raid. However, this raised the stakes the highest at a time when Israeli-Iranian tensions are critical. (5) Hours before the 22:30 strikes, a phone call was made between U.S. President Donald J. Trump and Israeli Prime-Minister B. Netanyahu. They spoke about the deteriorating situation in the region and about Iranian activity in Syria. The conversation most certainly revolved around the upcoming strikes, with President Trump being either informed or coordinated with. We cannot rule out the possibility that the U.S. has supported the shadow-raid at least politically. (6) The Israeli Government was anxiously anticipating a military retaliation after its shadow air operation against Iran at the strategic T-4 airbase near Palmyra/ Tadmur, Homs province, Syria. The attack was conducted in March 2018 and destroyed several hangars, warehouses, while killing four Iranian soldiers. This base was a strategic hub linking Iranian-affiliated personnel and assets flowing from Iraq and Syria for combat operations. The Iranian Government delegated its in-field “mastermind” Qasim Soleimani of the IRGC to draft and plan a military response against Israel. This also led to the IAF canceling its participation in a joint exercise with the U.S. in Alaska – all assets were needed home. Ti judges that Israel was monitoring consistent military logistics arriving into Syria to conduct or support that strike. 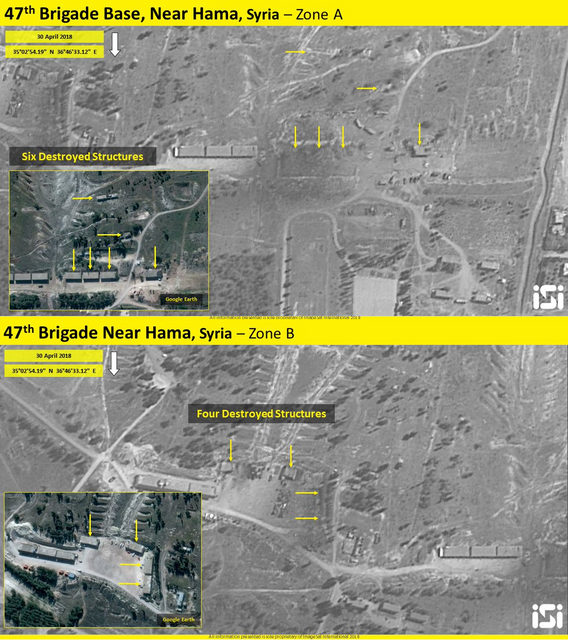 Satellite imagery shows aftermath of the April 29th clandestine raid (iSi) over the 47th Brigade Military Base – locations can be seen in the wider visual context on previous map sourced by Ti. 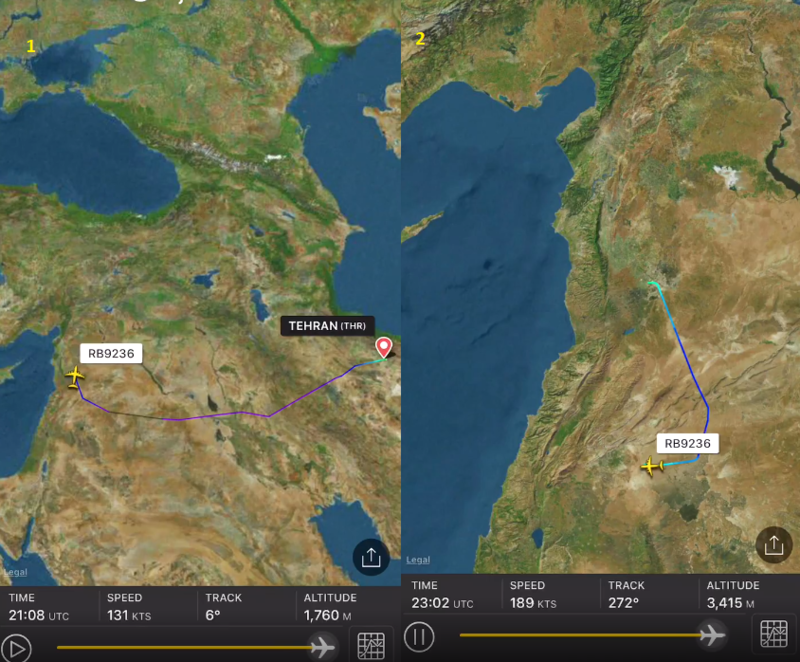 (7) The data of a civilian airline monitoring app shows that on April 29, a Syrian Arab Air Force 585th Transport Squadron (of the 29th Air Brigade’s four-engine turbofan strategic airlifter Ilyushin Il-76T YK-ATD) flew from Tehran Mehrabad (Iran) to -most likely – Hama Airport (Syria). After a short stop there, probably to unload and distribute some of the cargo to O-A (located just 10 km from Hama City), the plane flew to Damascus International Airport. 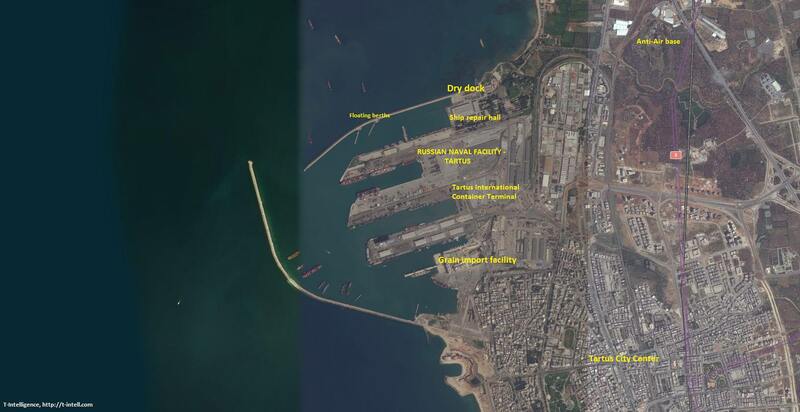 It is highly likely that the cargo contained important capabilities, such as medium-to-long range missiles, purposely deployed to take-part in the Iranian-planned retaliation against Israel for the T-4 raid. 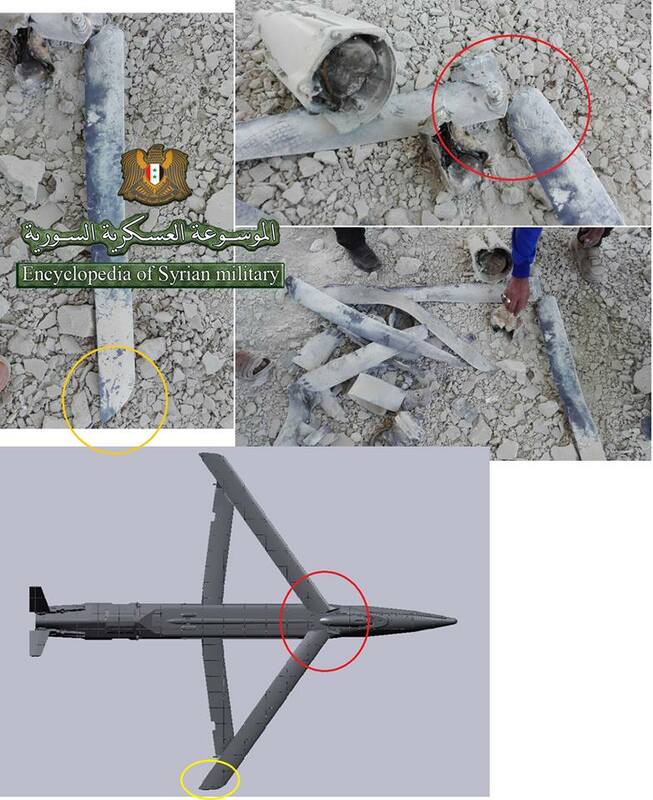 [Added: Intelligence from on May 2nd, 2018 suggests that the cargo contained anti-aircraft surface-to-air missiles (SAM)]. Ti determined that even without this circumstantial evidence, O-A was an important enough target to tempt Jerusalem to strike. Yet, no photographs of ordinance remnants have surfaced online yet to assess whether it was an airstrike or a surface-to-surface attack from a missile battery. OSINT reports claim that around 200 Iranian missiles were destroyed by the raid. (8) O-B’s importance comes from the cargo it was believed to be sheltering – however, there is no indication that weapons or missiles were there during the strike. But in this case, photos from the blast site were issued on Social Media. They show remnants of the missile dropped on the target. Crowdsourcing efforts identified the ordinance as being the GBU-39 Small Diameter Bomb. This is a GPS-aided and high-accuracy ordinance produced by Boeing to strike fixed targets (depots, bunkers, storage buildings). It is currently in use by the U.S., Israel, Italy and Saudi Arabia, and it can be launched by a number of widely used fighter jets and bombers, such as the F-15E (in use by both IAF and USAF), Tornado, Gripen, F-16 (in use by both IAF and USAF), and AC-130. Analysis of a Social Media source compares ordinance wreckage with the GBU-39. (9) Syrian-affiliated media claims that the U.S hit its base in Hama using assets in northern Jordan. While it is highly unlikely that the Kingdom of Jordan would have approved such an act to be committed from its soil, the U.S. does have an active military deployment in the country. It also controls a large swat of land around the al-Tanf area (Syria) through friendly Opposition groups operating there. The military deployment also contains an ingredient that might fit the description – the M142 High Mobility Artillery Rocket System (HIMARS). That is a light-truck mounted long-range rocket system. Not only it is deployed in Jordan, but since early-2017, sources in the Pentagon confirmed for CNN that it was moved over the border in south-eastern Syria. The purpose was to support the Opposition groups operating around the al-Tanf garrison in deterring regime attacks and in launching strikes against ISIS. The HIMARS can strike targets up to 400 km distance, which also includes O-A in Hama, but not O-B in Aleppo. (10) It is highly likely that the explosions at O-A and O-B were caused by a round of Israeli Air Force (IAF) “shadow” preemptive strikes purposed to degrade capabilities deployed by Iran to support a military retaliation against Israel. The United States was certainly informed beforehand, but it is unlikely that it played any role in the military operation despite key assets being in place. Back in April 21st, John Bolton pitched President Trump to include a list of Iranian-operated targets in the line-up of possible strike locations for his retaliation on the Assad’s regime use of Chemical Weapons in Douma. President Trump refused and bowed to Secretary of Defense James Mattis’ more-proportionate options. Both of the targets were a concern for Israeli national security, which would not mandate the President to change his mind over such a sensitive issue so fast and in such an offensive manner. This does not mean that the administration did not seek to embolden and encourage Jerusalem to conduct the strikes it saw adequate. 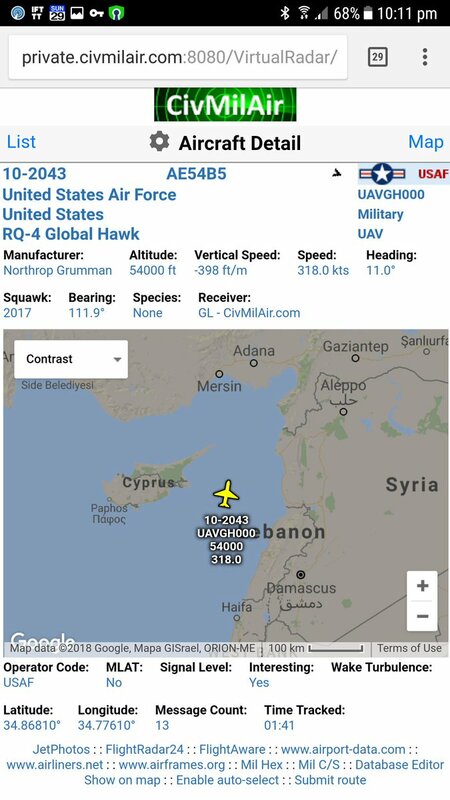 One sample from the Social Media source that shows the RQ-4 Global Hawk west of the Syrian coastline around 00:12 local time. (11) The U.S. was certainly informed about the operation and had unmanned aerial surveillance assets (UAV) active to provide Intelligence, Surveillance and Recoinassance (ISR) of the IAF strikes. A reputable Social Media source with access to civil and military air traffic data had noticed a U.S. Air Force (USAF)-operated RQ-4 Global Hawk drone conducting IMINT sorties over western Syria. Call sign UAVGH 0000, probably outbound from Sigonela or Aviano, regularly conducts such runs in the Eastern Mediterranean. However, on April 29, 1900 hours (local time) it was spotted turning back towards the Syrian coastline after completing the Levant-Sinai flight route. At 1943 hours the drone was already near Haifa (northern Israel). In that evening, UAVGH0000 assumed 54,000 feet altitude. The drone re-appeared several hours later that night after the IAF strikes. On April 30, 0012 hours the drone continued circling the same position. For almost three hours, the drone was most probably conducting a post-operation BDA before heading back to base. Whatever happened that night in Hama and Aleppo, the USAF Global Hawk drone was watching. (12) Syrian anti-air defense systems – as the S-200 – were successfully by-passed again. There are no reports of retaliatory fire neither on the delivery systems (batteries or fighter jets) nor on the missiles themselves. Russian assets were still not activate. (13) Israeli-Iranian tensions continue to boil as no external power manages to contain the situation from escalating into an open war. Following an almost two-hour ministerial meeting in Jerusalem, Prime Minister Netanyahu informed the U.S. and Russia that if Tehran strikes back, then Israel will “got to town” on all Iranian bases in Syria. The Government in Tehran issued more threats indicating an imminent retaliation of some sort. (14) The shadow-raid came in a sensitive context, as the Trump administration is expected to decided on whether to keep the U.S. in the Joint Comprehensive Action Plan (JCAP) or the “Iranian nuclear deal” by May 12, 2018. The Israelis and President Trump have stepped up criticism of the deal and of Iran’s activities in Syria. Urgent Briefing (4 min read) – A small pocket of land in eastern Damascus (also known as “Eastern Ghouta” is now the scene of the newest humanitarian catastrophy and intense military assault in Syria. In mid-February, Iranian and Russian-backed Syrian governmental troops have moved armed divisions and infantrymen from Idlib province to the exclave of Eastern Ghouta, near the capital. The scope of the military deployments is confirmed by remot sensing and social-media imagery. The build-up suggests that a renewed offensive is imminent. According to the United Nation, a score of 94 deaths (40 civilians) and 150 injured has been inflicted by Russian Aerospace Forces and the Syrian Arab Army (SAA). The Syrian Arab Air Force (SyAAF) has largely used its remaining helicopter fleet to drop cluster ammunition on the densely populated area. Airstrike persisted throughout 20-21 February. Casualties spiked to 310 people killed and over 1,500 injured – many of them civilians. Thermobaric ordinance was also seen to be parachuted by pro-governmental air raids in the adiacent neighborhoods. Most of the attacks took place at night, and included artillery shelling. Opposition forces responded with surface-to-surface rounds in governmental-held position in Damascus that also made civilian casualties. The increased shelling and air campaign is just a preparatory phase of a yet-to-come ground incursion, taking after the Aleppo example (the largest humanitarian disaster throughout this war). This was also suggest by Russian Foreign Ministry Sergey Lavrov. Controlled by Opposition Forces since 2013, Eastern Ghouta is a densely populated agricultural district on the outskirts of Damascus – together with quarters of Yarmouk camp, this is the last major area near the capital still under Rebel dominance. Home to 400,000 people, the region has been inherently under tight attrition and siege. The forces that dominate the area are equally controversial to the ruthless air campaign of their enemies. Dominance in the pocket is split between Ahrar ash-Sham, the Saudi-backed Jaysh al-Islam and al-Rahman Legion. The later allied with al-Qa’ida affiliate, Hay’at Tahrri al-Sham (HTS) in early 2017 to combat the former two, that we’re plotting to oust the jihadists. Fights broke out in the Summer of 2017 but quickly came to an end following an intra-Rebel ceasefire seeking to mutually-respect the areas of influence and subsequent checkpoints. However, while some more extreme than others, the majority of these groups are largely Islamist with profound puritarian feelings, and even Salafist traits that also view Western interests with hostility. Jaysh al-Islam is dominating the largest piece of the pocket : Stretching from Douma in the north to the south-eastern corner of Nashabiyeh. Ahrar ash-Sham controls a small corner in the north-west encompassing Harasta, while Failaq al-Raham holds the remaining south-west. Movement between the three areas is also highly difficult due to the polarized and volatile tensions between the factions involved – this being also consequential to the hardened lives of the local inhabitants, periodically resulting in deaths and injuries. The renewed Loyalist offensive of February 2018, is a direct violation of the ceasefire struck between Russia and Opposition forces in August 18th, 2017 in Geneva. To be fair, the truce was fragile to begin with – governmental pressure was enhanced immediately after its signing. Shelling and air rads re-occurred in September and October 2017, and we’re continued by an intensified attrition that suffocated the almost 400,000 people that inhabit the area. The “starve-and-surrender” tactics, so commonly used by the Loyalists through the conflict, have brought the pocket into a horrific state. Besieged from 2013, the population of Eastern Ghouta always had limited access to supplies. Now, that window is fully closed. In the early years of the war, many people were able to obtain essential supplies via informal dealing networks passing through tunnels connecting Eastern Ghouta with governmental-controlled districts in the vicinity. Many of those traders bribed Syrian soldiers to grant them passageway. 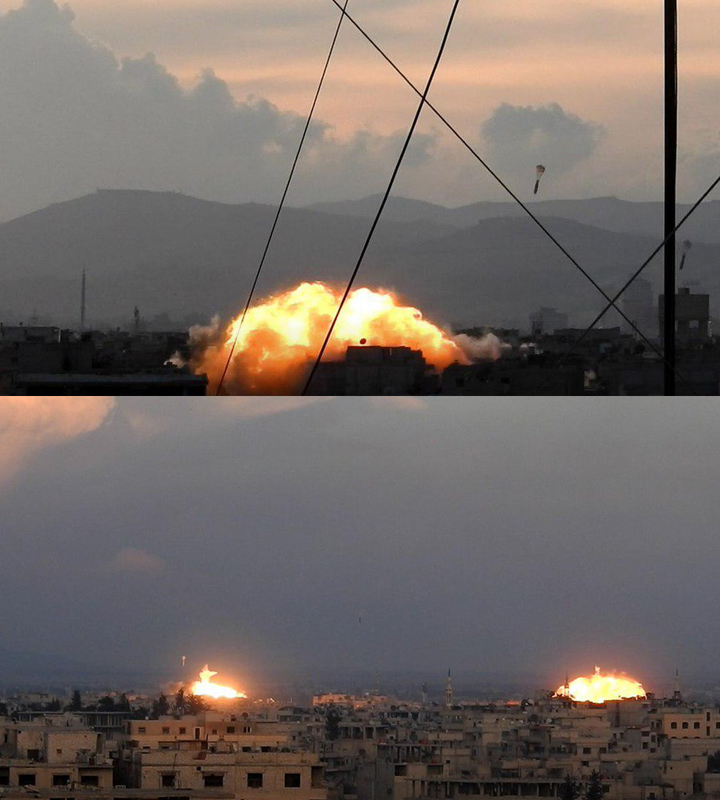 Thermobaric bombs dropped over Eastern Ghouta pokcet – sourced by Qalaat al-Mudiq user. Last year, the government closed the tunnels and limited trade. From September to November (when shelling and airstrike re-commenced regardless of the cease-fire), no commercial vehicles were permitted to enter the pocket at all. Limited deliveries resumed in December, but those we’re quickly ceased again. That led to the exhaustion of food supplied, dramatic price inflation, and deaths resulting from starvation. And with dealers unable to move outside the pocket, the last avenue of basic goods as sugar, flour and rice was cut-off. Today, a bundle of bread costs close to 22 times the national average, according to U.N. Inherently, malnutrition rates have reached unprecedented level, with 11.9% of children under five years old acutely malnourished. The last convoy to enter Eastern Ghouta was on February 14, and only delivered care packages enough for 7,200 of the 394,000 inhabitants besieged there. This was the sole supply-run in over two months. Furthermore, medical and emergency services are close to seize operating at all. Only since Sunday, when the Loyalist offensive re-commenced, 14 medical facilities have been taken out of service, according to Dr. Ahmad Dbis of the Union of Medical Care and Relief Organizations (UOSSM), which operates hospital there. Over 10 medical staff and volunteers have also been killed, while 20 were injured by the recent campaign. The situation will continue to degrade. The Russian military said that talks to peacefully resolve the situation in Eastern Ghouta had broken down and that Rebels there had ignored calls to cease resistance and lay down their arms. Opposition forces are accusing their opponents of forbidding humanitarian aid and food to enter the enclave, subsquentley using it as a negotiating leverage to re-shape a better deal that the already agreed de-escalation cease-fire signed in 2017. While local Opposition forces have not driven out AQ-affiliated elements from the pocket – which is a must. The dramatic humanitarian situation is the work of both parties involved in the war, but the malign presence of Salafists in the area and the Russian response to it are only making things worst. The United Nations has denounced the bombardment, which has struck hospitals and other civilian infrastructure, saying such attacks could be war crimes. The international arena continues to pressure Moscow, Tehran and Damascus with little chance of success. Ground elements continue to take positions on the northern and eastern axis around the pocket, while artillery rounds pound Rebel positions. Parallel talks between Russia, Syria and Egypt are also reportedly taking place. Akhbar newspaper reports that the Egyptians are pressuring Jaysh al-Islam to push out HTS-affiliated groups (Rahman) out of the pocket. A successive combination of the options previously stated. The Turkish military intervention to clear Afrin has stagnated in the past weeks. Spearheaded by Syrian Rebels, operation Olive Branch failed to capture more than a few pockets of lands on the borderlands. While the Kurdish defenses played a role, the key input in this deceleration can only be found in Idlib province. Russia and the Loyalists were the ones that greenlighted operation Olive Branch after striking a deal with Turkey. But they are also the ones to sabotage it. In response, Ankara is enhancing pressure in the Rebel fronts of Idlib complicating the Regime’s advances. The following analysis will detail why Turkey intervened in Afrin, how the operation was planned behind-the-scenes, and how did it came to near failure. THE FEDERATION OF NORTHERN SYRIA OR THE KURDISH ROJAVA? Euphrates region: Kobani province (Kobani and Sarrin) and Tel Abyad province. Jazzira region: Hasakha province (Hasakha, Tell Tamer, Serekaniye and Derbasiyah) and Qamishli province (Qamislhi and Derik). The mid-Euphrates river valley has not been yet distributed within an existent region nor has the SDF created one. The cities of Raqqa and Tabqa have been placed under a civil council, while the Deir ez-Zor Military Council (DMC) of the SDF is still conducting anti-ISIS raids in the far east corner – an entirely Arab Sunni territory. 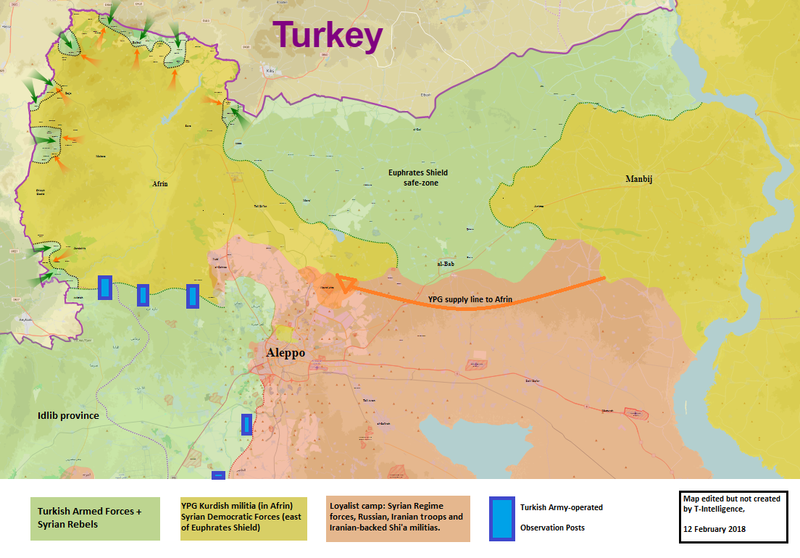 Ankara perceives the Federation of Northern Syria as a Kurdish state that would embolden the decades-long insurgency in southeastern Turkey to manage a breakaway – starting a domino effect in its path to a greater unified Kurdistan. Despite the resemblance with the Kurdistan Regional Government (KRG) from northern Iraq, this entity cannot be controlled or curbed through soft power tools. The Assembly from Qamishlo is dominated by the PYD, and the Kurds outnumber other militiamen, despite US efforts to enlist more Arab fighters. There is no political counter-weight to the YPG/PYD hegemony that Turkey can use to its advantage. As opposed to northern Iraq where Ankara would traditionally ally with the Barzani clan and the KDP to counter PKK or PUK. The truth is somewhere in the middle. The main Syrian Kurdish groups remain wedded to their vision of a Syria where they gain autonomy, in a form of federalism, that is at odds with Assad’s determination to control all of Syria. And given their far-left ideology they try to mitigate an inclusive policy of uniformity in an attempt to include the diverse ethnic-groups and confessions in northern Syria – which is fairly unrealistic given the reality on the ground. Many reports even indicate that the PYD is suppressing opposition parties or that it even displaced Arab villagers from their homes. While there are instances of harmonious Arab-Kurdish cohabitation within the tribes of Syria’s northeastern provice of Hasakha, exporting that model in others parts – including Arab majority regions – has poor chances of succeeding. And parading with the imprisoned PKK leader’s portrait, Abdullah Ocalan, in the center of Raqqa is not sending a good post-conflict message. Several swats of land controlled by the Federation of Northern Syria are either dominated by Arabs or Turkmen – two ethnicities that Ankara is trying to weaponize against the Kurds. It follows the classical and almost cliché divide et imperia strategy of sectarianism. That is namely the case of Raqqa governorate and the territory from northern Aleppo province already controlled by Turkey and embedded Rebel groups through operation Euphrates Shield. In early 2017, Raqqa province almost followed the same route. Ankara offered Washington the alternative of using Turkish-backed Islamist groups as Ahrar ash-Sham or the Syrian Turkmen Brigades instead of the Kurdish-dominated SDF to capture Raqqa. That offer was rejected by the Trump administration that then proceeded to arm directly the Kurdish elements of the SDF – a premier for the U.S. strategy in Syria. As a result, the self-proclaimed capital of ISIS, Raqqa, was successfully liberated between June and October 2017. Powerless and outmaneuvered, Turkey had to come to terms with the reality on the ground. However, the U.S. guaranteed that the weapons will be retrieved afterwards. That process never occurred as the anti-ISIS operations were later extended down the eastern banks of mid-Euphrates river valley – a process still ongoing. In January 2018, The United States announced plans to further enhance the Syrian Democratic Forces (SDF). The Pentagon attempts to transforme the SDF from an alliance of armed tribesmen and rigid militias to a quasi-professional regular armed force. This plan is vital for security and stability in the liberated territories. It will also serve as a lethal and deterring counter-insurgency “silver bullet” against the displaced, fleeing or hidden jihadists plotting to revive the destroyed “Caliphate”. Presumably, it would also serve the geopolitical role of countering Iranian hegemony developing the region. On the other hand, it suggests that the Kurdish elements will not be de-armed or abandoned by the United States. Turkey decided to act on the only Kurdish-controlled land that is out of the U.S-led Coalition’s operational interest, protection or reach: the Afrin canton. To achieve this, it had to turn to Russia who provided geopolitical protection for that area. The Kurds (YPG) knew that Afrin was uncovered in face of Turkish hostilities as it lacked U.S. troop presence that would deter them – as they did in Manbij. Inherently, the YPG had to look for another “guarding angel”. Moscow had a major interest in gaining leverage over Ankara as it was preparing to initiate an offensive against the Turkish-backed Rebels from Idlib. Gaining control of Afrin would draw Ankara back to the negotiations table in that matter. Accordingly, YPG secured the protection of the Russian Federation. In mid-2017, Moscow deployed military policemen in Afrin to setup an observation outpost flying the Russian flag. That checked Turkey’s move in the region for a while. However, the circumstances on the battlefield changed. The Loyalist camp could not penetrate Idlib province, the largest Rebel-stronghold. Furthermore, the (unofficial) al-Qa’ida franchise there, Hayat Tahrir al-Sham (HTS) had unleashed a major crackdown on other Rebel fronts, further polarizing the Opposition between Islamists and hardline Salafist jihadists. Fighters defected from other militias to join HTS, which emboldened the group to prey on territories controlled by the weakened Rebel groups. As it seized key routes and cities, most of the Syrian Rebels were subdued under HTS’s command. Throughout this quagmire, in November 2017, the Turkish Armed Forces managed to establish a military outpost in Mount Sheikh Barakat, western Aleppo countryside, near Idlib. The province was becoming an impossible nut to crack without Turkish endorsement or cooperation. A deal was struck: Afrin for Idlib. Russia pulls its soldiers from Afirn, essentially opening the airspace for Turkish jets and operations, if Turkey intervenes to soften the situation in Idlib. Ankara began pulling Rebel fighters from Idlib and positioning them on Turkish borderland with Afrin. Military convoys of the Turkish Armed Forces (TSK) were spotted entering Idlib province. Moscow expected them to put the jihadists from HTS back in line, but instead the Turkish Army took positions on the mountains overlooking Afrin from northern Idlib. It became clear that Turkey was laying a siege on the Kurds. In sync, the Loyalist camp, namely Russian, Assad’s forces and Iranian-backed Shi’a militias accelerated their offensive in south-western Idlib taking advantage on the lower Rebel numbers there – transferred by Turkey on the Afrin front. A deal is a deal, so Russia also evacuated its soldiers from Afrin essentially OKing Ankara to commence with the offensive. On January 20th, The Turkish Air Force (TAF) began pounding villages in the canton and Afrin city. Rebel light infantry units were formed on the Syrian borderlands embedded with entire mechanized units of the Turkish Armed Forces. A bridge was built from Turkey’s Hatay province for military vehicles to cross the Karasu river into Qara Baba, a village in Afrin, Syria. At the end of the day, over 108 sorties were launched by Turkish F-16s. It kicked-off a slow-moving offensive that made headlines more because of the indiscriminately air strikes than ground achievements. On the same date, the Loyalist managed to capture the strategic al-Duhur air base in western Idlib province – a precious victory against the Rebels that was facilitated or at least accelerated by the Turkish operation. Immediately afterwards, the situation started to suspiciously erode for Ankara. The next day, the Syrian government publicly condemned the Turkish intervention invoking a sovereignty infringement. Pro-government forces even opened Aleppo for YPG to move militiamen and logistics to Afrin. In exchange, the Kurds will trade grain and oil from areas controlled in northeast Syria (Hasakha and Deir ez-Zor), a source said to Al Jazeera. Secretary of Defense James Mattis said that close to 50% of Kurdish militiamen are now shifting from active front with ISIS to fight-off the Turkish intervention. The international community, including the United States, the European Union, France and Germany condemned the operation in harsh terms. In Idlib, the situation was also worsening for the Turkish-backed Rebels. The loss of al-Duhur air base was a defeat too great to ignore. Many of the Rebels transferred to Afrin returned to keep the line against Syrian, Russian and Iranian-backed troops. On February 3rd, the Opposition Forces downed a Russian Su-25 fighter jet in skies of Idlib. The weapon used was a Russian-made Man-portable air-defense (MANPAD), Sa-18 Igla, that the Rebels captured only days ago from the Kurdish YPG in Afrin. This complicated the relationship between Ankara and Moscow. It is reported that Russia consequently re-closed the airspace over Afrin. Turkish government spokesman Bekir Bozdağ denied the claims. But security sources told Cumhuriyet that Turkish warplanes and helicopters had only been patrolling the Turkish side of the Syrian border and not crossing since then. Banned from flying over Afrin, the Turks were also not welcomed in Idlib. On February 5th, The Syrian Arab Army or allied Iranian-backed paramilitary groups have reportedly started shelling the freshly established positions of Turkish forces in the southern countryside of Aleppo province – according to both opposition and pro-government sources. The Turkish Army arrived there from Idlib to establish observation posts as agreed in the Astana de-escalation accords. It is known that non-Syrian Army pro-government units based opposite the Al-Eis area are mostly Iranian-linked or Iranian (proper) forces. The Turkish Army has apparently responded to the attacks with a rocket artillery salvo against pro-governmental positions near Shugheydilah. Casualties were reported on both sides but the incident was buried under the rug. It appears that Russia is willing to push forward the Syrian regime, or even encourage Iran to take more central stage in dealing with Turkey. On February 10th, a Turkish T-129 attack chopper was downed by Kurdish anti-aircraft fire originating from Afrin. The helicopter crashed in Turkey’s Hatay province resulting in the death of both pilots. Further, a photo surfaced online showing Kurdish YPG militiamen operating an Iranian-made infantry vehicle armed with an 106mm mounted anti-tank cannon. This suggests that Iranian made weaponry has been transferred to the Kurdish forces in limited amounts. In response, new Turkish military convoys entered Idlib to establish more observation posts near Loyalist-held positions in Aleppo and Hama. This move enforces the Astana de-escalation accord, essentially blocking the Loyalist offensive in the area. As of February 12, more than 20 Turkish soldiers and 150 YPG fighters have been killed since the military offensive began. Seemingly, Moscow only struck the deal with Turkey to facilitate further gains against the Rebels in Idlib. As soon as victory was achieved in al-Duhur, it began to backpaddle on endorsing Operation Olive Branch. This is not to say that Afrin is safe from further airstrikes or land incursions. The combined forces of Turkish and Syrian Rebels will move forward with the ground operation regardless of the great costs awaiting them. It is already reported that TAF air strikes have restarted. The Afrin and Idlib provinces are uniquely interconnected in this late stage of the Syrian Civil War. Likewise, the Ankara-Moscow dynamic has proven to be one of the most creative and unlikely relations. It would be no surprise if the parties managed to compromise and outmaneuver each other again. Strategic Analysis (20 min read) – The Syrian quagmire is nearing the end. The Assad regime is quasi-victorious with more than half of the national territory regained and over 75% of the Syrian population under its control. The Opposition forces are utterly degraded and boxed into a few isolated patches of land in the western parts of Syria. The Russian Armed Forces as the Iranian-backed Shi’a paramilitary groups have played a key role in this effort. The military intervention launched in 2015 was mostly motivated by long-term strategic goals that seek to undermine NATO’s southern flank and push forward the agenda of resurgence. Inherently, the Russian Federation will maintain a permanent military presence in the Mediterranean Sea and the Levant amid the end of the Syrian Civil War. The Latakia Air field will continue to host dozens of fighter jets and bombers, while the Naval Facility of Tartus will be enhanced to form a Mediterranean Fleet consisting of a nuclear submarine and 11 warships. Guarded by the S-400 system, the Russian military-assets on the Syrian coastline form a new Anti-Access Area Denial Zone (A2AD). The strategic ramifications of these actions are to vanguard the Bashar al-Assad regime in Damascus, challenge NATO’s freedom of maneuver on its southern flank and enhance Russia’s geopolitical posture and security needs throughout the region and the world. The Russia State Duma authorized in mid-2015 the deployment of troops in Syria. The Regime of Bashar al-Assad submitted an official request to Moscow for military support. Weakened by defections and casualties, the largely conscripted and weary Syrian Arab Army (SAA) was close to collapse. This would have been catastrophic to Russia’s long-term strategic plans and shorter-term goals. Grand Strategy of Resurgence. Vladimir Putin continues to see the relationship with the West as a zero-sum game, that can be leveraged to assert the strategy of reviving the Soviet-era influence and posture. The West had little-to-no appetite for a new intervention in a Middle Eastern quagmire, however, Russia still tried to deny Syria for the U.S. or the Sunni-block (aligned with the West). In the process, the Kremlin sought to use Syria to establish an active operational presence in the Middle East. This required the construction or enhancement of military installations (ex: Latakia Air Field & Tartous Naval Facility), the deployment of significant troop numbers and advanced hardware (ex: S-400, Iskander). On one hand, the establishment of such a persistent active force also provided Moscow with the opportunity to battle-test its troops and showcase new technology; essentially using the Syrian theater of War as both a battleground and a showroom. On the other hand, it allowed Russia to transform its initial “expeditionary” posture into a permanent-strategic one. This resulted in the creation of a new Anti-Access Denial Area (A2/AD) and laid the foundation for a future Mediterranean Fleet, targeting NATO and the U.S. The confrontation with the West remains an influential mindset in contemporary Russian strategic culture and planning. Russian soldiers doing target practice in the Mediterranean Sea from the Tartus port, Syria. Domestic affairs. The internal context in 2015 was defined by the negative impact of the Western-sanctions imposed to Russia. The economy was taking hits in trade, inflation was on the rise subsequent with the devaluation of the Ruble. The few opposition parties began capitalizing on the huge costs of the illegal annexation of Crimea. Putin’s popular perception spikes in the opinion polls when he confronts the West. Inherently, Syria was yet another opportunity for exactly that. Historical heritage. Since 1971 when Bashar’s father, Hafeez al-Assad seized power in the government and the Ba’ath Party through a coupe d’état, Syria immediately became an accommodating ally for Russia. In 1971, the Syrian Government leased the port of Tartus to the Russian Navy, developing a naval maintenance facility to support incursions in the Mediterranean Sea against NATO. The single-party system ran at Damascus took inspiration from the Soviet Union and sought to remain affiliated with the satellite system of the Eastern bloc, and its military aid. Together with Nasser’s Egypt, Syria was Moscow’s backbone in the Middle East. The contemporary Syrian-Russian alliance has its roots in the Soviet-era foreign policy. Geo-economics. Syria has remained the top buyer of Russian/Soviet-made weapons and military technology. This amounts to a considerable fraction of Moscow’s revenue from a strategic economic sector: weapons trade. Energy Security. The energy potential is significant for a top player on the market such as Russia. Leaving aside the fertile lands of eastern and central Syria, Damascus promised to outsource the exploitation of off-shore gas deposits to Russian companies. These enterprises have already enlarged their market share in the region due access to northern Iraqi oil & gas deposits, and could potentially link their assets into a robust energy network in the Middle East. This will allow Russia to further control production, transportation hubs and deepen its monopoly of supply to the European market. National Security and Counter-terrorism. Attempting to draw thousands of extra-national Muslims into their ranks and aid their respective cause, several groups emphasized the Islamic component of the war and called for a mobilization of the Ummah. The main beneficiary were the Salafist groups affiliated with al-Qai’da: Jabhat al-Nusra (now Hayat Tahrir al-Sham/ HTS) and the splinter group, the Islamic State of Syria and Iraq (Da’esh/ ISIS). Spearheaded in Syrian and Iraq, the Global Jihad 2.0 promised by ISIS emerged as a major threat for the West and the entire world. This renewed menace promised deadly attacks overseas and mass-radicalization and recruitment of Western-born Muslims; and not only. According to Vladimir Putin, 5,000-7,000 people from Russia and Central Asia are fighting on the side of ISIS. A study by the International Center for International Security found that half of those originated directly from Russia, while the rest were recruited through Russian jihadi networks. Another investigation, this time done by Reuters found that the Russian authorities softened the fight against domestic Islamic militants, allowing some to leave for Syria. According to the Syrian Opposition, Chechens are the second-largest ethnic group fighting Assad. It is assumed that thousands also joined the al-Qa’ida (AQ) affiliated groups in Syria as Hayat Tahrir al-Sham (HTS) due to the historical ties it had with the self-proclaimed Caucasus Emirate. The previously mentioned group is the largest jihadi movement active in Chechnya and Dagestan. The front encompasses many factions that have later switched their allegiance to ISIS. Beyond all doubt, Russia has a major terror problem. This will only amplify if the jihadist propaganda outreach is efficient, and when/ if battle-tested fighters return to their home country to plot attacks and enhance local insurgencies. In this regard, the military intervention of 2015 was largely branded as an anti-ISIS operation. However, studies as the ones conducted by the Institute for the Study of War have proven that “the Russian air campaign in Syria appears to be largely focused on supporting the Syrian regime and its fight against the Syrian opposition, rather than combatting ISIS.” This observation is also backed by a Reuters analysis showing that 80 percent of Russia’s declared targets in the first months of intervention in 2015 have been in areas not held by Da’esh. These studies are also enforced by own data analysis based on official and reported air strikes and their location. Undoubtedly, a significant portion of the Opposition is represented by AQ-affiliated jihadi groups of which termination is beneficial. However, this does not take from the fact that the campaign was miss-advertised and has systemically ignored ISIS (the recruiter of thousands of Russian citizens) until the 2017 Astana Accords that brokered a cease-fire with the Opposition groups. Nor does it excuse that Russian air strikes also targeted vetted and legitimate Opposition groups that disavowed or fought their radical peers. Legitimate and factual as the counter-terrorism concern may be, it was merely used as a P.R. tool to falsely-advertise what it was a genuine geopolitical move directed against the West, and in facilitation of the Kremlin’s goal of regaining some of its lost influence. (1) One, located on the coastline of Latakia, was considered to be the largest external intelligence collection facility that the Kremlin operated. 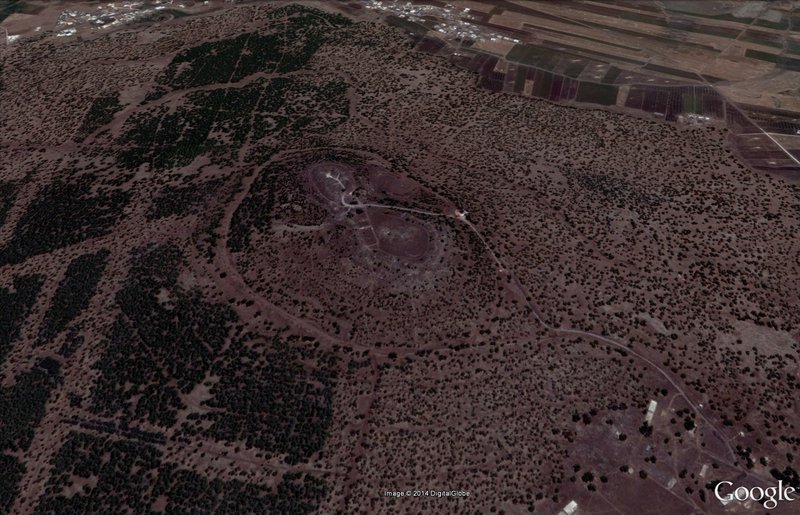 (2) Another base, presumed to be titled “Center S” was located in al-Hara, Da’ara governorate in Syria’s deep south. The facility was jointly operated between the radio-electronic unit of the Russian Foreign Military Intelligence (GRU) and their Syrian counter-parts. Their efforts were directed at recording and decrypting radio communications of the Syrian Opposition groups. The revolution began in Da’ara province, therefore key influencers and leaders were to be tracked and neutralized in that area. 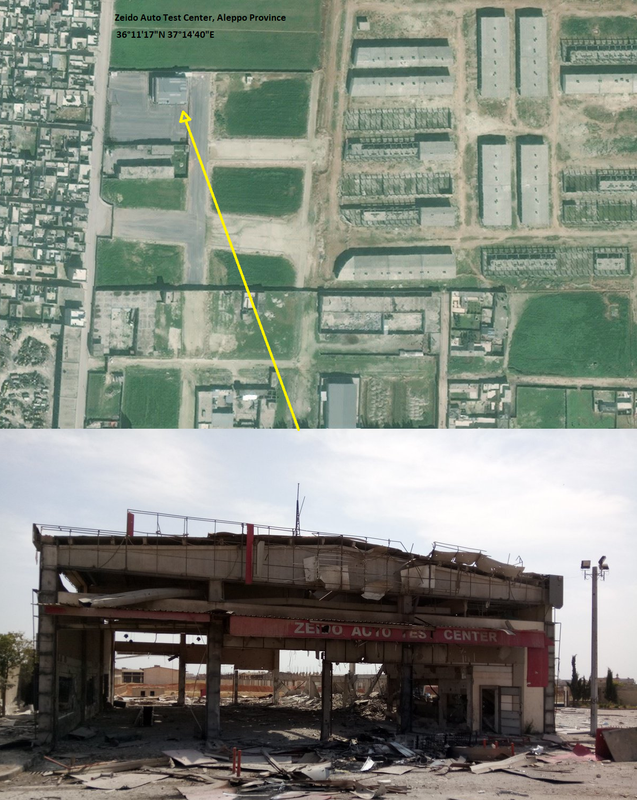 The Belingcat determines that this facility is at least partially responsible for high-value target (HVT) acquisition and neutralization of Opposition commanders, rendering it strategically important for the Assad regime. The Northern Military District of the Israeli Armed Forces based in the Golan Heights was also the target of communications interception. This suggests that the installation might have pre-dated the Syrian Civil War, and that the initial purpose was more related with the Israeli-Arab confrontation, than counter-insurgency efforts. This hunch is also backed by a disclosure made by the Debka File as appeared in the Washington Times. The private-Israeli intelligence firm revealed in 2012 that Russia expanded and upgraded the radars used at the surveillance station. The range was reportedly extended to all parts of Israel and Jordan and as far south as the northern Saudi Arabia. It was also reported that Iranian concerns of a regime change at Damascus was key in enhancing the outpost’s capabilities. Various photos pinned to walls show visits from top-ranking senior military officers of the Russian Armed Forces or from Kudelina L.K., Counselor to the Minister of Defence of Russia. (translation provided by Belingcat and Oryx Blog). Satellite photo of ”Center S” found by the Oryx Blog. The outpost was abandoned when Opposition groups stormed it in October 2014. Rebel commanders later issued videos and photos of the sensitive information found inside the facility. The raw data was exploited by the public sphere and open-source analysts to determine the scope and scale of this facility. The network of SIGINT stations used to spy on Israel and later, on the Opposition groups is believed to be wider and concentrated in Da’ara province. Logistics and hardware are key in assuring functionality and efficiency in military operations. In order to accommodate the thousands of troops, dozens of mechanized assets and fightersjets, the Russian Armed Forces relied on self-built facilities (some known, some rumored) and shared-bases with the Syrian Arab Army (SAA). The Khmeimim Air Base (Latakia province) and 1971-established Tartus Naval Facility (Tartus province) demands the most of our attention. They were built and enhanced on the Syrian coastline, a region largely inhabited by the governmental-loyalist and dominant, the Allawites. This region is a stronghold for the Bashar al-Assad regime (an Allawite himself) due to the sectarian history that promoted Allawites into top military and political positions following the instatement of the Assad dynasty in 1971. Tiyas (T4) Air Base (Tadmur/ Palmyra, Homs province) – largely used for the three battles of recapturing and defending Palmyra/Tadmur from ISIS. Shayrat Air Base (Homs province) – The presumed air base used for launching the chemical strike against Rebels and civilians in Khan Shaikhoun (April 2017). The military base was hit by the U.S. with 59 tomahawk cruise missiles in retaliation, damaging hangars and fighter jets. This is the last remaining major air field operated by the Syrian forces. Deir ez-Zor Air Base (Deir ez-Zor province) – under siege between 2012-2017, it was exclusively supplied through an air bridge. Russian assets were only deployed there in late-2017 when the area was liberated. This base served in support of expeditionary operations on the mid-Euphrates valley and all the way to Abu Kamal. Observation Post in the SDF-held Afrin canton (Aleppo province) – the Afrin canton is isolated from the rest of the Federation in Northern Syria. It is an enclave between Turkey and the Turkish-controlled northern Aleppo. It is administered by the U.S-backed and YPG-led Syrian Democratic Forces (SDF). The YPG brokered an uneasy deal with Russia to shelter it from Turkish attacks. Russian forces were deployed in the area in mid-2017 and established a small observation post to monitor the tensions. In December 2017, reports suggested that the Kremlin was pulling-out its troops, accommodating the Turkish plans of besieging and liberating the area, in exchange of handing Idlib province to Russia. In mid-2015 Russia began establishing an air base in extension of the International Bassil al-Assad Airport in Latakia, on the Syrian coastline. Advertised as Russia’s strategic center for combating ISIS, the base was leased by Damascus free of charge and for an undefined limit of time as signed by a bilateral accord in August 2015. New amendments have been brought to the treaty in January 2017 that leases the Hmeimim aerodrome for 49 years to the Russian Armed Forces with subsequent extensions over 25-year periods. The same deal applies for the Tartus Naval Facility. The external perimeter of the base has Syrian military protection, while the inside is bound to Moscow’s jurisdiction, embedded personnel and their family receiving diplomatic immunity and privileges. Russian military engineers repaired and extended the runaways to suit fighters jets, troop carriers and heavy transport cargo plans to land and take-off. RT was granted exclusive access to the Air Field in October 2015, when the facility was still under works. They showcased air-conditioned and white-painted living quarters that could host over 1,000 personnel, in addition to aircraft hangars, field kitchens and even saunas. The circumstantial purpose of this Air Base is to serve as a nerve-center for Russia’s operations in Syria. Serving as a launching pad for the vitally-needed airstrikes supporting the Syrian government. When the air campaign started in mid-2015 in Syria, about a dozen Su-25 ground-attack jets were stationed at the Air Field according to Washington Post’s estimates. Throughout the years, the number of fighter jets has varied and remained largely unknown. However, own estimates based on satellite imagery obtained by independent Twitter analysts and Jane’s intelligence via Airbus Defence & Space, showcase an average number of 23-26 jets. A line-up of aircrafts from July 15, 2017 show: 11 Su-24s, 3 Su-25s, 10 Su-27s or 35s, 4 Su-3 and 6 Su-34, amounting to a record-high of 33 jets on the ground at once. The surplus of aircrafts came after a Russian MiG-29K from the sole Russian aircraft carrier, Admiral Kuznetsov crashed in the Mediterranean on November 14, 2016 following a problem with one of the arrestor cables. The Kuznetsov does not have a catapult to launch its aircraft and it relies on a ramped deck to get the jets aloft. Although the problems were known for the outdated Cold War-era ship, its deployment in the Eastern Mediterranean was more of a (failed) show of force attempting to replicate a modern U.S. Naval Task Force. Following the incident, the aircraft carrier was returned to the naval base in Sevastopol, Crimea, while the nine fighter jets (8 Su-33s and one Mig-29k) have been transferred to the Latakia Air Field – as revealed by Jane’s Intelligence satellite imagery analysis. This upped the number of fighter jets for a period of time, boosting the intense air campaign that besieged Aleppo until December 2016. Afterwards, Vladimir Putin announced a partial withdraw of its aircraft and troops in early 2017. However, the number hardly decreased. Satellite images from May 2017 still showed around 26 fighter jets stationed on Latakia’s runway. And even though the Kremlin announced a third withdrawal of forces from Latakia, satellite imagery posted by Qalaat Mudiq Twitter shows a remaining air fleet of 17 jets. 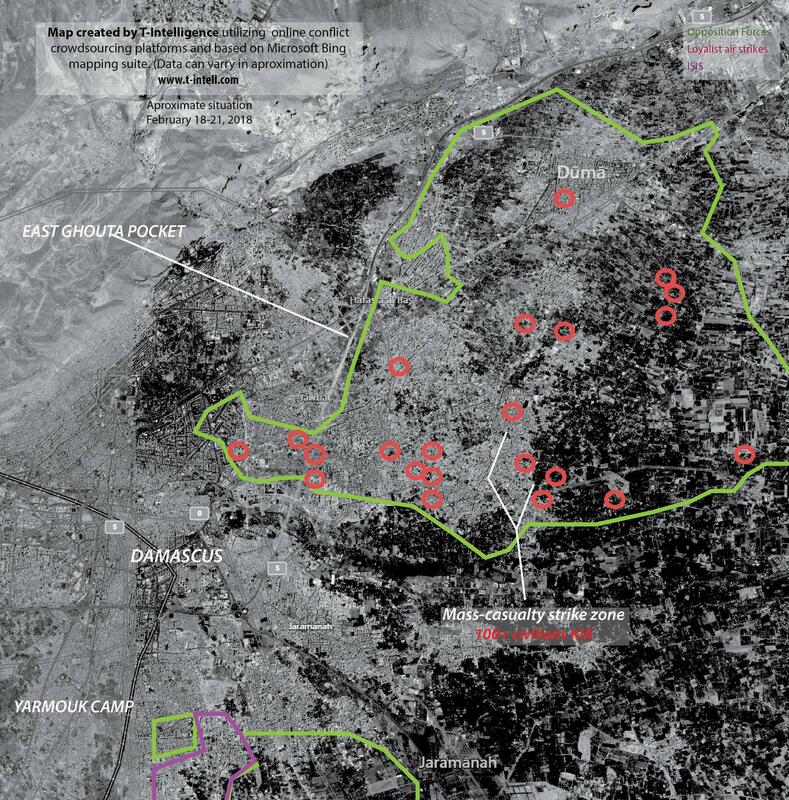 Other air assets such as helicopters (attack or transport) or surveillance planes have not been included in this analysis, although they have been spotted in large numbers on the Latakian runaways. A2/AD– Closing the Southern Airspace? In order to safeguard such a robust deployment, Russia made efforts to build an enhanced anti-air posture. In the Mediterranean, the Kremlin followed the same recipe of creating A2/AD “bubbles” as in Kaliningrad, northern Kola peninsula and Crimea. Through its key military deployments, Russia established a combination of integrated strategically-important anti-air defense systems and tactical nuclear-capable offensive missile batteries, covered by Electronic Intelligence (ELINT) counter-measures. In Syria, such a robust posture is mostly hosted by the Air Field in Latakia. The purpose of an Area-Denial Access Zone (A2AD) is to deny NATO air superiority or presence in selected areas. This is also one of the most constant practices in Russia’s resurgence strategy. Anti-access capabilities are used to prevent or constrain the deployment of opposing forces into a theatre of operations, whereas area denial capabilities are used to reduce their freedom of maneuver once in a theater (Luis Simon; 2017). Russia attempts to prevent its opponents from establishing air supremacy in strategically significant regions. Most probably, the Russian always had in plan to protect their vast military build-up by deploying advanced air-defence systems in Syria. But following the downing of a Mig-29 by a Turkish F-16 in November 2015, Moscow accelerated the deployment of the advanced S-400 surface-to-air missile system at the Khmeimim Air Base. The S-300 was also commissioned to guard the Naval Facility in Tartous, alongside a network of vessels equipped with mobile anti-air and anti-missile interceptors. The naval assets continue to patrol the Eastern Mediterranean and Syria’s shores. On September 2017, Jane’s Intelligence reported the deployment of a second S-400 system in Syria. The claim was confirmed by satellite imagery provided by Airbus Defense & Space. The anti-air hardware was placed near Maysaf, a small city located in north-western Homs province. The move further enhances Russia’s overall anti-air denial zone doubling-down on the strategically important shore but also widening its reach over the central Syrian airbases in Shayrat and Tyras (Homs province). Combined with defensive hardware, Russia also deployed its utmost offensive arsenal. 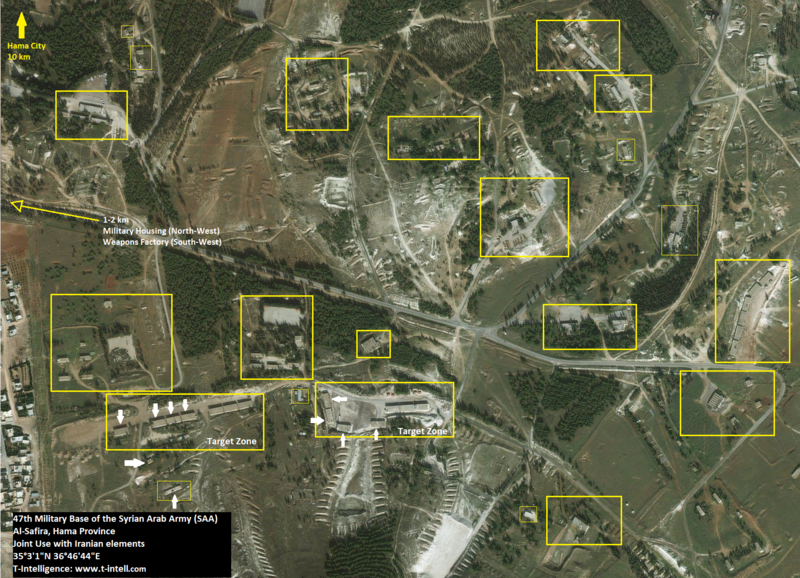 In December 2016, the private satellite imagery company ISI confirmed the presence of two Iskander batteries at the Khmeimim Air Base. Additional photos acquired and analyzed by ISIS on January 2017 confirm the reports that Russia used the batteries to strike ISIS positions in Deir ez-Zor all the way from Latakia. This was most probably a show of force after their attempts to camouflage the ballistic system were unfolded by private satellites and was showcased all over the news. The presence of the Iskander in Syria was rumored since early 2016. The Iskander-M is a tactical (short-range) ballistic missile system. 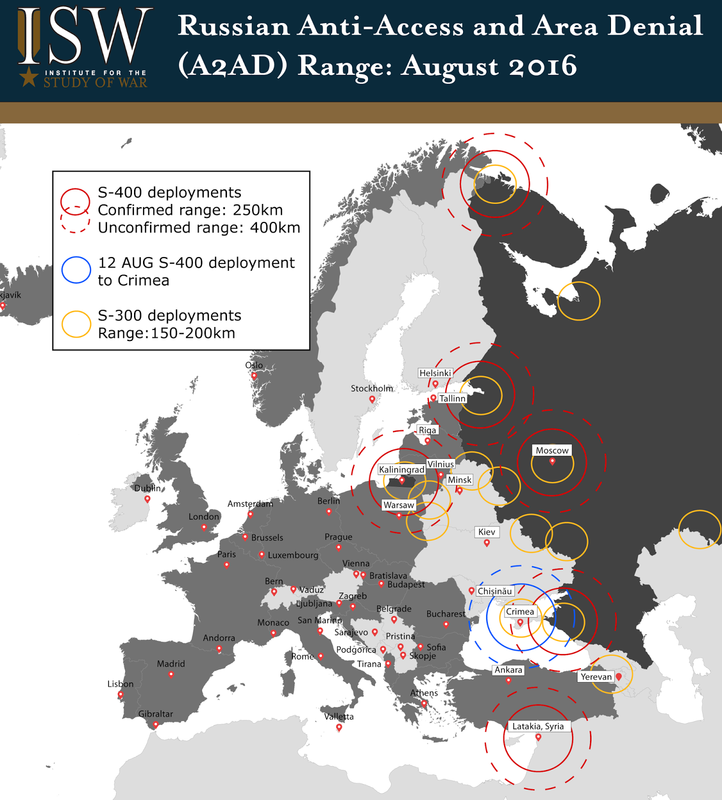 According to CSIS’s Missile Defence Project the Iskander-M (extended-range) has a 400-500 km striking range. Due to its operational mobility, launch weight and payload, the weapon system can strike both stationary and moving targets, including SAM sites and hardened defense installations. It was purposely built to overwhelm enemy anti-air missile defenses in a flexible and timely manner. Most importantly, the Iskander-M is also capable of firing nuclear warheads. This is one of the strongest and accurate weapons in Russia’s anti-access strategy. Further image analysis show that the Iskanders have their own launch pad in Latakia Air Base. Suggesting that the hardware is also in Moscow’s plan for the 49-year long presence there. Both the Iskander strike ranger and the S-400 cover zone encompasses the NATO strategic Incirlik Air Base in southern Turkey, the British bases in Cyprus, Israel, Jordan and parts of Saudi Arabia. Without a doubt, the Russians created a AD/2D bubble in NATO’s southern flank. Russia seeks to further contest NATO’s control of the southern flank by introducing a permanent Mediterranean fleet that would extend its military might in the Middle East and further enforce the A2/AD established in the area. These plans would add an element of strategic nuclear deterrence, and will seek to influence the geopolitical order in the Mediterranean basin. 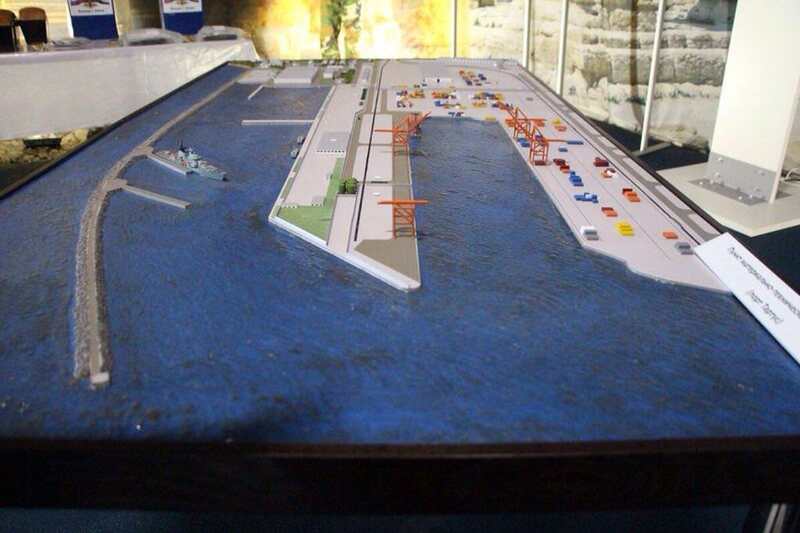 The long-forgotten port of Tartus plays the key role in this endeavor. Since its foundation in 1971, Tartus was never considered to be a real military base. Officially registered as a Material-Technical Support Point (MTSP), the port was solely used as a local repair shop for Russian warships, sparing them from a trip way back to Sevastopol, Crimea in case of malfunctions. Starting with the Syrian Civil War, this was used as a cargo hub for weapons transfers to the Loyalist camp. It later supported Russia’s war efforts against Opposition groups and ISIS. The port helped re-establish the 1992-dissolved Rusian 5th Operational Squadron that was purposed to counter the U.S. Sixth Fleet in the Cold War, and extend Russia’s sea power into the Mediterranean. But as the conflict nears its closing fights, Moscow and Damascus signed a treaty extending the lease of the port for an additional 49-years. According to the TASS news agency, the deal, signed in early 2017 will expand the Tartus naval facility, Russia’s only naval foothold in the Mediterranean, and grant Russian warships access to Syrian waters and ports. Sergei Shoigu, the Russian Defence Minister stated that the structures built in Latakia and Tartus have begun forming a permanent presence in the region. The later will host a naval strike group consisting of a nuclear submarine and 11 warships. Everything except an aircraft carrier can be docked there. This will attract additional coastal missile defence deployments and anti-submarine measures. The Tartus build-up represent the bedrock of an upcoming Mediterranean Fleet armed with a strategic nuclear deterrent – escalating Russia’s posture from the tactical-limited Iskander. Part of the strategy of recovering its lost power, Russia seeks to project trust into regional stakeholders. It hopes that as the West grows weary of further interventions, destabilized states as Libya and Egypt will seek Moscow’s help for combating terrorism. This will open the door for further weapons trade, military deployments (extension of power projection) and energy opportunities. However, Russia lacks both the intent and the capacity to do a better job at counter-terrorism than the West. As Chatam House notes, The real driving forces behind Russian involvement in the region are a mixture of ambition, opportunism and anti-Western sentiment. In early 2017, Russia was believed to have deployed Special Operations Forces in an Egyptian army base near the Libyan border. US and diplomatic officials said that any such Russian involvement might be part of an attempt to support the Libyan military commander, Khalifa Haftar, who suffered a setback on oil ports controlled by his forces. In Cairo, the Egyptian and Russian ministers signed a $21 billion deal to start work on Egypt’s Dabaa nuclear power plant. While just in November 2017, Egypt has reached a preliminary agreement to allow Russian military jets to use its airspace and bases. Egypt is the second largest recipient of U.S. aid from the Middle East, a country firmly aligned with the Sunni-block, and holds the naval access point for European energy and maritime trade. Capability to secure its assets in Syria. To echo Admiral Richardson the U.S. Chief of Naval Operations, what Russia is doing is more of a wishful projection than actual “denying” adversaries. If the AD/2D bubble did control the Syrian airspace, then the United States would have been deterred from launching 59 tomahawk cruise missiles from the Eastern Mediterranean into a joint Syrian-Russian air base in Shayrat. It is true that Russian Command was notified beforehand in order to avoid unwanted escalation. The U.S. Navy was only targeting the Syrian Regime for its use of chemical weapons (CW) in Khan Sheykoun. But it is also true that Moscow could have operated its anti-air defense system (if it didn’t at that time) and (attempt to) intercept the ordinance – at least to send a message, if not to protect the air field. The notification came through the Qatar-based de-confliction line. That channel is used by US CENTCOM and the Russian Aerospace Command to conduct joint air control and avoid unwanted incidents. While rational from both parts to maintain a dialogue in such a crowded airspace, it is possible that Moscow would have imposed a complete no-fly zone if it had the power or the leverage to do so. Notably when competing in close operations room as the Raqqa province or the mid-Euphrates valley in Deir ez-Zor. Russia’s resurgence is real, the AD/2D is palpable and threatening, but it still cannot top Western technology and strategic planning. On the long-run, the creation of AD/2D bubbles is counter-productive for the Kremlin. Moving advanced air defense and tactical nukes on NATO’s borders will only urge its richer and more capable Western adversaries to further proliferate precision-strike missile systems. A tech-race that Moscow cannot keep-up with, chiefly given its worsening economy. The United States will maintain its naval supremacy for the next decades despite any attempt from foes to compete. In the current geopolitical environment, Russia’s plans are caught between a rock and a hard place. The Kremlin is playing Russian roulette in the Israeli-Iranian divergence. It simultaneously attempts to maintain its military cooperation with the Lebanese Hezbollah, Palestinian militias, Iraqi PMUs and Iranian Revolutionary Guards Corps, and to pivot with Jerusalem. A gamble that has proven dangerous and inefficient. Russia failed to enforce its guarantees made to the Israelis, that Iranian-backed elements would not take positions near the Golan Heights or build military bases in southern Syria. In fact, the situation is worsening as Hezbollah and Iraqi PMUs have seized the Damascus-Baghdad highway, establishing a direct supply line between Lebanon, Syria and Iran. We can expect an increase in the number of IAF clandestine air raids tasked to neutralize Hezbollah HVTs and weapons transfers. This will render the Russian multilateral diplomatic engagement as a missed opportunity in a changing Middle Eastern order. Recent Rebel attacks on the Latakia Air Base only shows that Russia and the Regime are still unable of fully securing vital and strategic assets from unsophisticated acts of aggression. Further, troop movements and hardware deployment have been poorly camouflaged by traditional or electronic means. In contrast, U.S. Special Operations Force in Syria enjoy far better operations security/ operational secrecy (OPSEC) than Russia’s. And this given the fact that the Western press is larger, more resourceful and freer to conduct such investigations. While a new tide is announced in the Eastern Mediterranean, the West is still able to operate in Russia-made A2/ADs. There is little to nothing that the Kremlin can do to compete with U.S. military superiority. However, given the sensitive emerging context in the Middle East, the build-up in Syria holds great potential for regional ambitions. This will provide the Russians with more opportunities to challenge NATO’s southern flank. 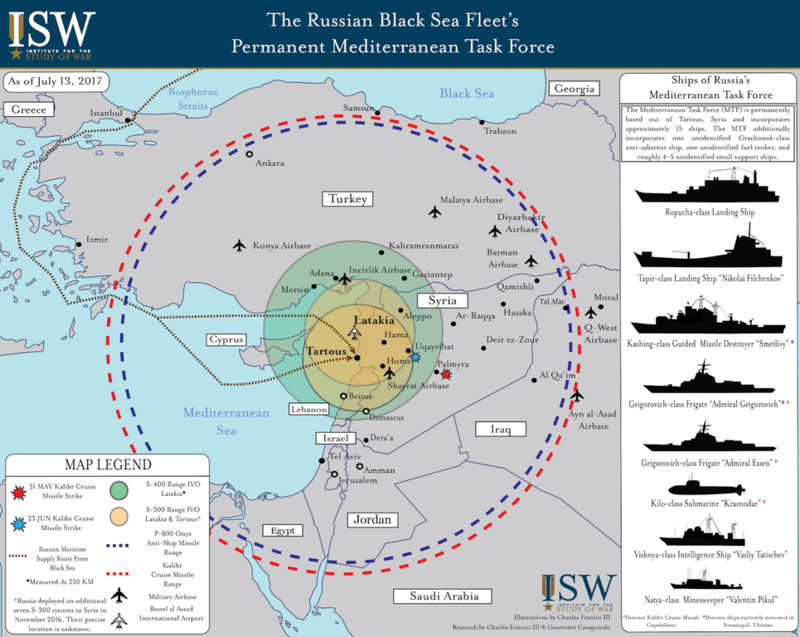 Moscow’s new permanent fleet escalates tensions with the West, and raises key questions in regards to the freedom of navigation/trade and maritime security in the Eastern Mediterranean. American, Russian troops in Manbij: Preventing an all-out Turkish-Kurdish face-off? No Comments on American, Russian troops in Manbij: Preventing an all-out Turkish-Kurdish face-off? URGENT BRIEF – The United States have deployed more forces near the northern Syrian city of Manbij, liberated in July 2016 from ISIS, by the Syrian Democratic Forces (SDF)-led by the Kurdish militia, YPG. Territory already transferred to Russian-Syrian control in order to prevent a Turkish assault on it. SITUATION REPORT – A major merger has occurred in the past days in Syria, giving birth to a troubling Jihadi force, called Tahrir al-Sham. The group is built on the bedrock of Al-Qaeda in Syria. Rumors and buzz surfaced about clashes between the two strongest radical opposition groups: Ahrar ash-Sham and Jabhat Fateh al-Sham. Both of them are based in Idlib Governorate located in northwestern Syria, while Idlib city is placed just 40 km southwest of Aleppo. They have supposedly received funding over the years from individuals originating from the Gulf states, and have Salafist agendas. STRATEGIC FORECAST – Reflecting on the Syrian Civil War’s end of the year and debut of 2017 I have outlined the following scenarios. The analysis consists of a procedural process of summarizing the context, deepening into present tendencies and outlining the prospects. Sources are as always, Open (OSINT) gathered through social media crowd-sourcing and personal empirical and holistic conclusions.